We buy houses throughout Prescott with competitive cash offers. With our cash for homes service, selling your home in Prescott have never been easier. Our professional home buyers are available to schedule a free evaluation at your convenience. We will make a competitive cash offer for your home exactly as it is; clients are never required to make repairs to the home before accepting an offer. You get to pick your own closing date, and can even remain in your home as a tenant once the sale is final. That means you can continue to enjoy the historical downtown district and outdoor recreation areas as long as you like. Most homes close in as few as 72 hours, so there is no drawn-out sales process to deal with. We buy houses throughout Prescott, including single-family homes, multi-family complexes, cabins, and corporate buildings. Our professional real estate investors do not base our cash offers on the housing market, so you never have to worry about the volatile nature of the economy. Instead, we give you a competitive offer based on the location and condition of your home. Prescott real estate is in high demand with both students and retirees right now, which will be factored in to your offer. To sell your home with no agent means you are never charged additional fees for repairs or damage. 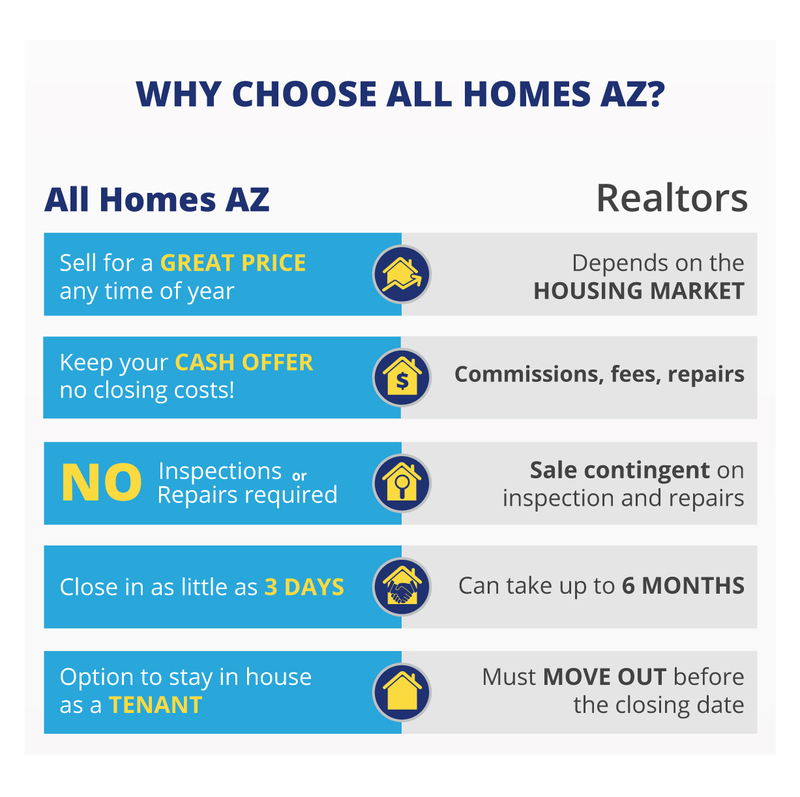 With All Homes AZ, there are no closing costs, commissions, no agent, service charges, or mystery fees. The offer we make is the price you get – period. Prescott residents trust All Homes AZ with their real estate needs. Contact us today to schedule your free in-home estimate and learn more about getting a cash offer for your house.